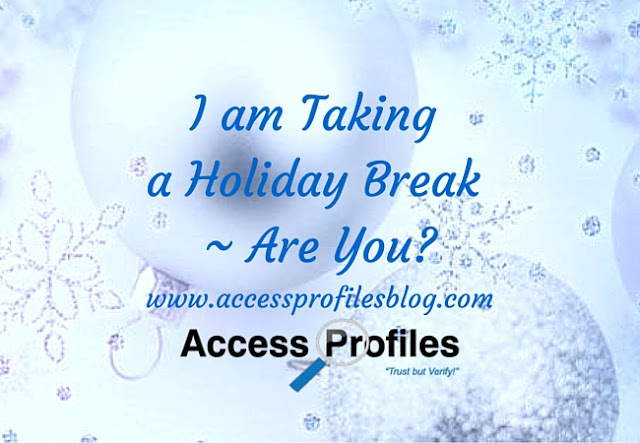 Access Profiles, Inc.: I am Taking a Holiday Break, Are You? I am Taking a Holiday Break, Are You? I love the holidays. For me, it has always been an entire season that begins with Thanksgiving and doesn’t end until after the New Year! It is a time filled with family gatherings, seeing friends, baking cookies (which really only happens once a year! ), watching Christmas movies and listening to Christmas carols. And the quiet times spent with all the lights off except for the tree, a cup of tea, or a glass of wine, are my absolute favorite! The holidays are also when my family takes complete precedence over work. While during the year I balance the two, one winning over the other as necessary, I need this time for family. To that end, I will be taking a break from blog writing and work until the new year. I wish all of you the chance to do the same! I will be sharing some old posts with a theme of looking forward and helping you with your business. I hope you enjoy them! May you remember to savor the memories you will create with those you love. Nothing says holidays more! Join me again next year for more tips to help You succeed in Your Small Business! Find out more About Me & My Services too!